In NetBeans 6.5 we have a new feature: QuickSearch. With QuickSearch we can search in the Help system, but also search for actions and invoke them. The QuickSearch input field is at the top right of the NetBeans IDE. We can invoke it quickly with the shortcut key Ctrl+I in Windows. Suppose we want to compile a Java source file we are working on. We can do this by using the shortcut key F9 or go to Run | Compile. Or we use QuickSearch and type compile. 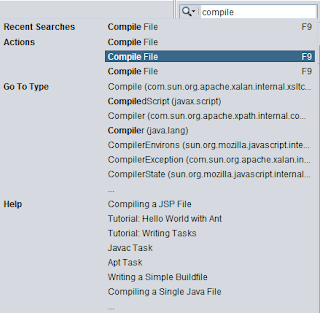 NetBeans shows the search results for compile and among them is the Compile File action. We can select the action from the list and execute it. This is also a great way to learn about the NetBeans IDE without searching through all the menus.